No lie, we all want longer eyelashes and more perfect brows but it takes a long time to achieve it with makeup. Ain't nobody has time for that! Achieving that perfectly poised set of eyebrows and pretty lashes may not be as easy as those YouTube videos make it out to be but lucky for us, eyelash extensions and brow treatments are all the rage now. Let these salons sort it out for you, whether you’re after Bambi-like lashes, brows worthy of a K-Pop starlet, cat eye-like fluttery lashes, or anything in-between. Now you can truthfully hashtag your selfie on the Gram: ‘#iwokeuplikethis’ because you're going to look so good, you won't need any eye makeup. 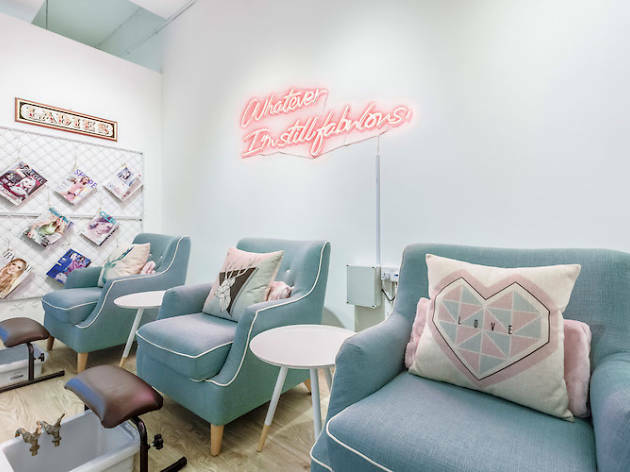 The cosy interior of Flutters is every pastel lover's dream come true – especially eye-catching are the neon lights with positive messages hang on the wall above comfy light blue armchairs used for manicure and pedicure sessions. 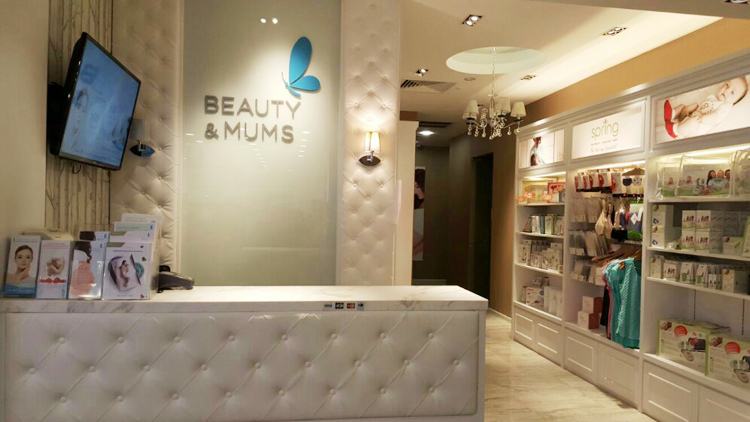 As its name suggests, you can also get lash extensions done at Flutters – there are beds discreetly hidden behind a door. The salon specialises in fluffy and natural-looking lashes but can also tailor the thickness and lash types according to your preference. Michelle Ng recommends… So-fine Souffle ($125). Extremely light and fluffy criss-cross lash extension technique achieves the most natural lash extensions I’ve ever done. I bumped into a friend a couple of hours after the session and she didn’t notice my lash extensions until after I pointed it out to her – talk about enhancing your peepers naturally. Expect a voluminous effect that opens up your eyes without the heavy density – it’s perfect for those with sparse lashes as this technique fills up the gaps naturally. 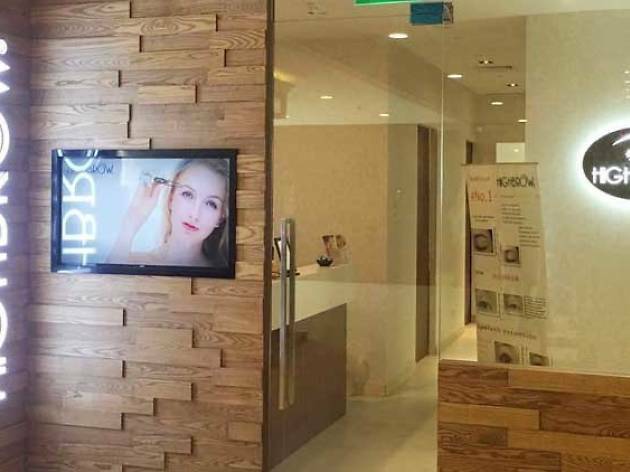 Tucked on the fourth level of The Cathay, Jlashes is a brow and lash salon co-founded by a husband and wife pair Johnson and Jenny. Lashes are its main draw and the salon is popular among those looking for over-the-top lash extensions – they offer lashes that go up to 15mm in length (think Kim K-esque lashes) for its Tutu Volume lash ($178) but can also tone it down for those seeking a more natural look with the classic lash ($108) that still guarantees 100% coverage with at approximately 300 lashes. At the moment, Jenny takes all the eyebrow embroidery ($580) appointments and utilises both microblading and microshading to achieve a natural-looking brow. The outlet takes a maximum of four people at a time but the second outlet at Tanjong Pagar willl accommodate up to 12 people. Michelle Ng recommends… Camellia lash ($168). A step up from the 2D Volume lash ($134) but not as dramatic as the Tutu Volume, the Camellia gives a gentle but dense as six lash extensions are attached to each original lash. Don’t worry about the extensions weighing your lashes down, the ones used at Jlashes are extremely fine and lightweight – expect to have approximately 800 extensions in total which is probably the most you’ll ever find at any lash salon. Sensitive eyes peeps, you’re in luck. My lash therapist Sheena was extremely gentle and careful with the application and I actually, for the first time ever, fell asleep without experiencing any eye irritation. Wake up to fuller lashes – and ditch the mascara – when you get yours done at Private Room, where lash extensions start from $108, and touch-ups from $30. 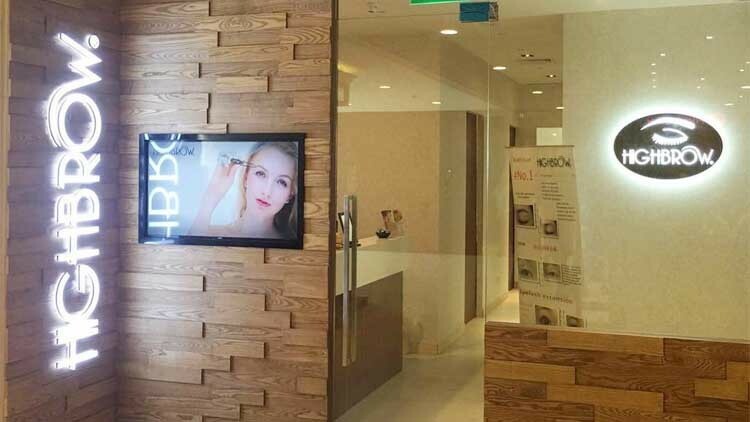 The beauty salon imports its synthetic lashes from Korea, and achieving the doe-eyed look's only an hour-long session (or less) away. If you're looking for yet bolder peepers, try the Japanese or Miracle Eyelash perm ($45-$57). 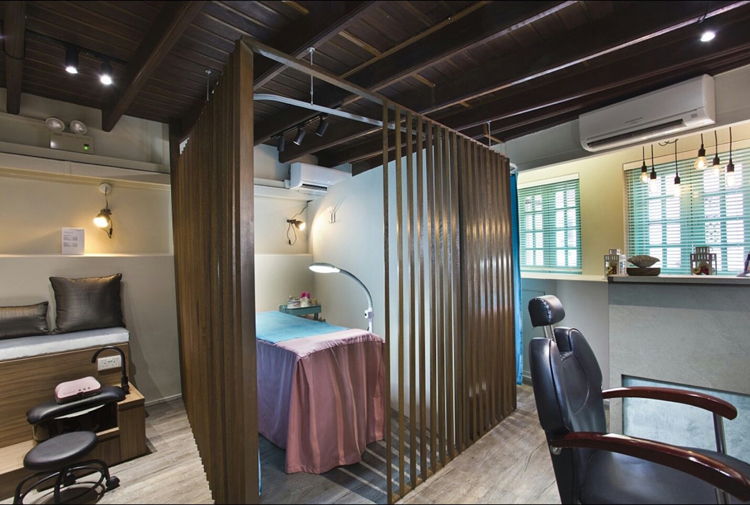 Completing the range of services within Private Room's intimate space at its Tanjong Pagar outlet are options such as Brazilian waxing (from $22 for the bikini line), Korean soft brows ($888) and manicures and pedicures (from $7 for an express manicure). Rebecca Liew recommends the… Flat lash extension ($128). Unlike natural eyelash extension ($108), these adhere to the eyelids for longer and create more volume. You're also given the option of going all-out or toning things down with a more natural look, which is what I requested. Lashes come in diameters of 0.15mm and 0.20mm, and range from 8 to 16mm in length – but mine were kept to between 9 to 11mm, given that I normally wear glasses. The 40-minute process was quick and relatively painless, apart from some stinging in the eyes caused by the glue. It's perfectly normal, though, and you're given a lash brush after to maintain the natural curl of your new, volumised lashes. Bat them as much as you can – around half of the lashes drop off within the first week, and the rest after a month. Hands up if you fear unshapely eyebrows. 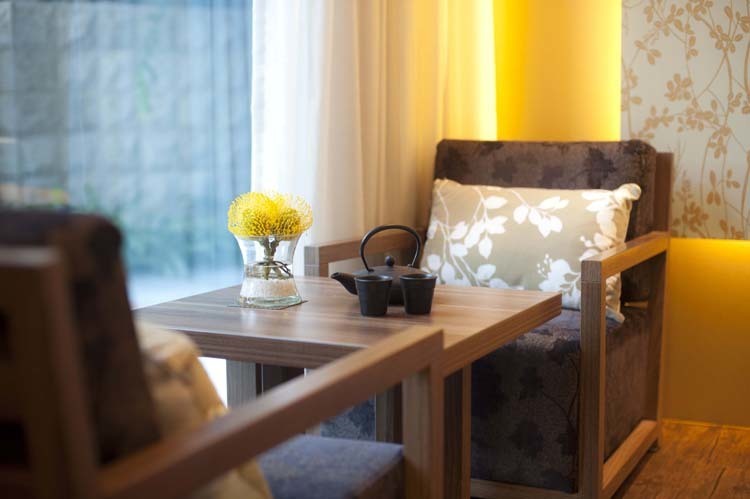 Put to rest those jitters by heading to Erabelle – its relaxing Japanese-inspired decor, and cred with the local influencer crowd will soothe even the antsiest of us. 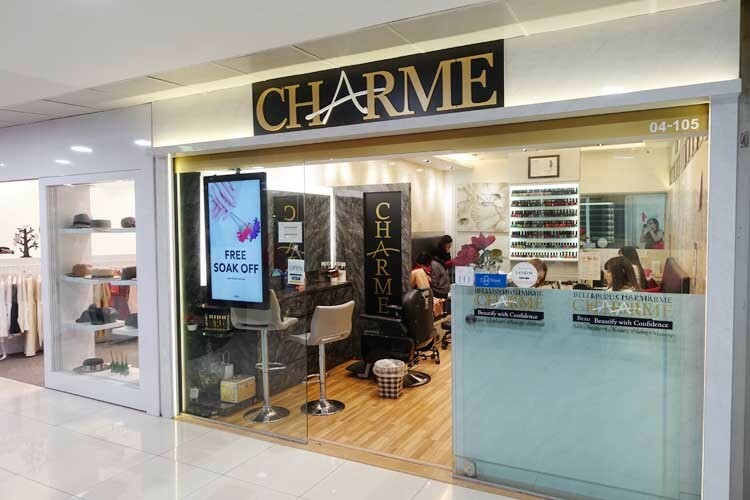 Head to any one of its four themed outlets (Seletar Mall, Eastpoint Mall, Orchard Visioncrest and VivoCity), where beauty addicts can knock themselves out with the huge variety of facials, as well as eyeliner and lip colour embroidery. But where Erabelle really shines is in its brow services. No caterpillar arches or weird blue-green brows here. Mineral and organic pigments are layered on your brows and a special in-house shading technique is used for a soft, natural look. And whether you’re looking for a simple design ($50/20 mins), full-fledged embroidery or even a special sesh for the guys (Erabrow Men’s Trim, $80/20 mins), the artists are all trained for at least a year to analyse your features and design a complementing eyebrow shape. Bonus points: if you’ve had a bad brow experience, the Erabrowlogy Redesign treatment ($1,690.60 for five sessions) is a lifesaver. Your brows will be reshaped and colour-corrected – all without laser removal. 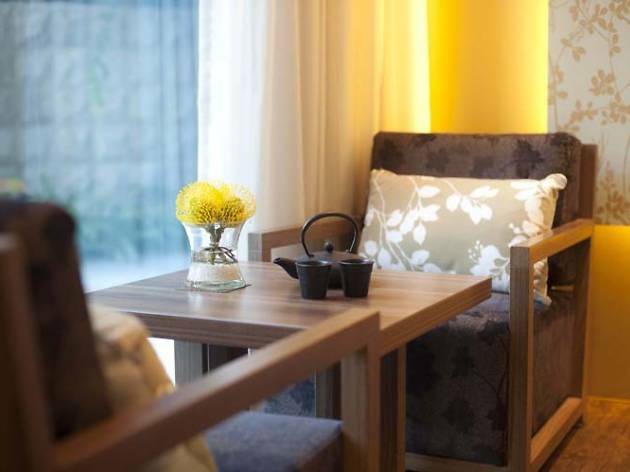 Jessica Lai recommends the… Signature Erabrowlogy treatment ($1,314 for four sessions). A brow mask was applied to slough off dead skin before my artist set me down for a customised brow design based on face shape, hair colour and bone structure. Once the brows were shaped to my liking, it was full steam ahead for the actual embroidery. Numbing cream was applied on my brows and I barely felt anything as the artist embroidered the design. The hour-long process presented me with balanced, polished brows that framed my face perfectly – and I could swear my face looked a tad more ‘V’-shaped, too. Founded in 2012, Highbrow is a relatively new player in the eyebrow game, but it's since expanded to three outlets across the island. Its signature treatment is the Brow Enliven (from $798), a painless eyebrow embroidery service that sculpts perfect brows to frame the face. 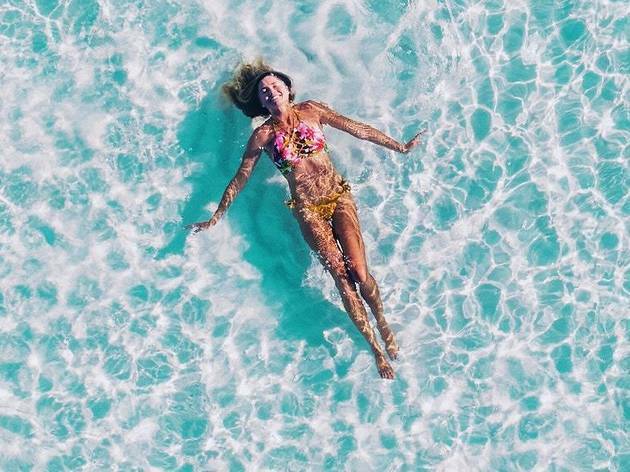 This service injects ink only into the epidermis of the skin, making sure that you won’t be left with discoloured and unsightly brows in a couple of years. Nicole-Marie Ng recommends the… Eyebrow Embroidery by Creative Director ($1,388). 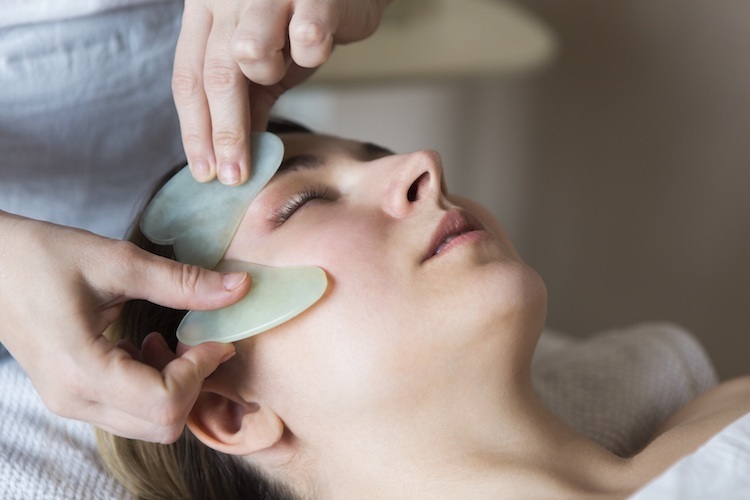 When it comes to the face, don't take any chances – splurge on a service you can trust. 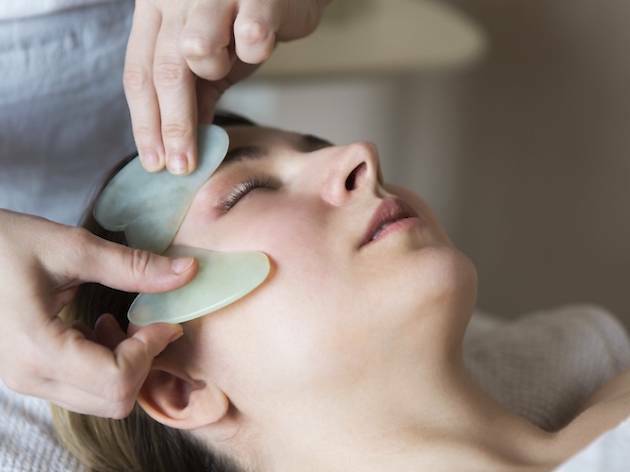 While a treatment by one of Highbrow’s regular therapists is priced at $798, I felt more comfortable in the hands of Sun Qi, who has been with the brand for two years. She spent an hour drawing and redrawing eyebrow shapes until I was happy with the way things looked. Despite the long process, she was patient and thoroughly accommodating throughout. Save time doing your brows in the morning by getting eyebrow embroidery (from $388) done at Bellus de Charme. The results last for two to three years depending on skin type – embroidered brows fade faster on oilier skin. If your lashes are naturally long, get them permed ($50) so you can bid goodbye to your eyelash curler for at least three months. 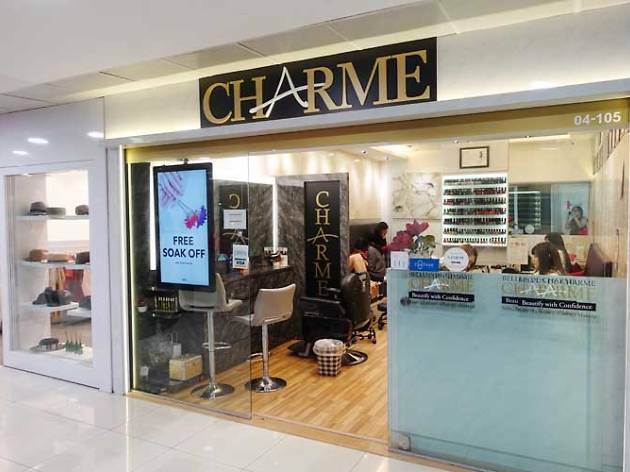 Bellus de Charme is also your one-stop shop for other beauty needs. 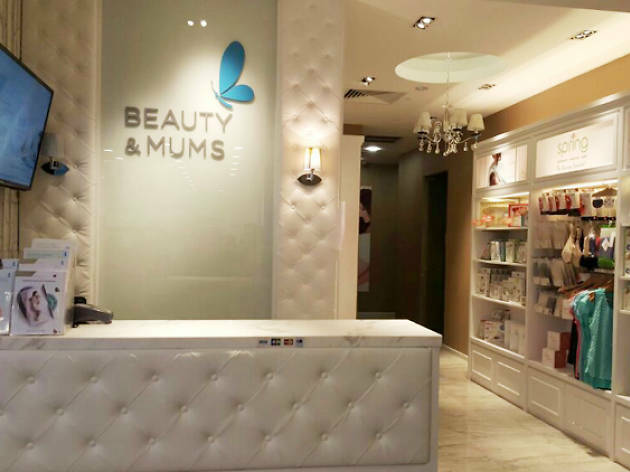 Its range of services include manicures and pedicures (from $14), hand and feet treatments ($22-$50), makeovers (from $40), and hair removal procedures such as waxing ($12-$70) and IPL ($68-$388). Tiffany Chow recommends the… Gradient Mist HD brow embroidery ($388), with touch-up sessions at $250. My brow stylist, Chung Lee Peng, recommended various brow shapes, then patiently drew and changed the outlines of my eyebrows so I could visualise what they'd look like after the session. Embroidery specialist Jess Leow applied numbing cream before starting work on my brows, constantly checking if I felt any pain during the procedure (I didn’t). The eyebrows faded over the next few weeks, but still maintained their shape, especially at the tips. 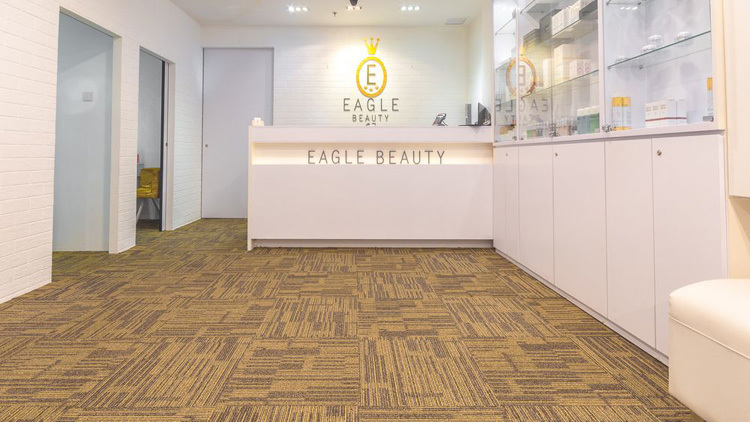 Set up by veterans of the industry with more than a decade of experience in the beauty scene, Eagle Beauty knows its stuff. 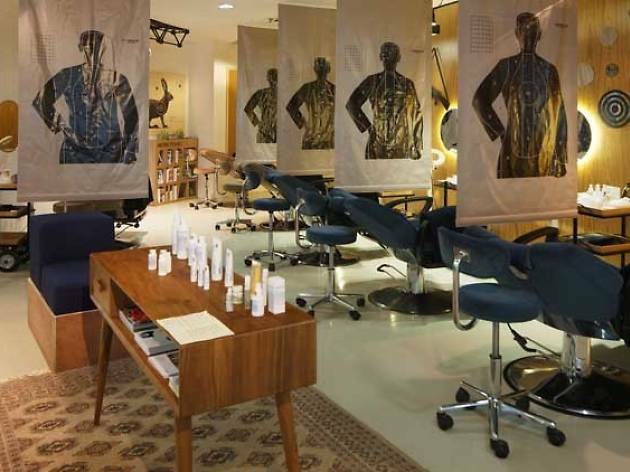 The founders themselves conduct eyebrow embroidery sessions alongside their team of stylists. 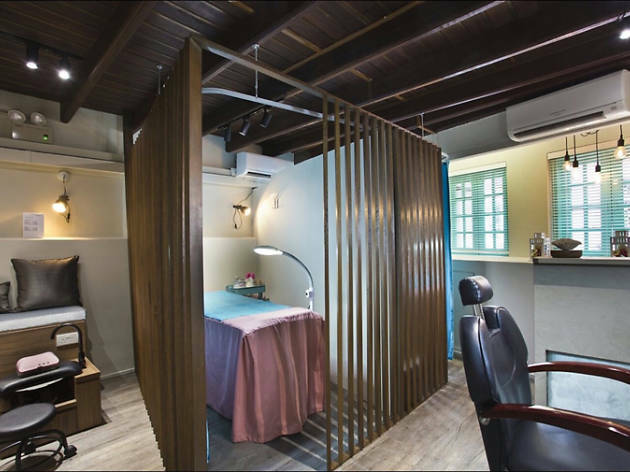 The salon also offers other grooming services at its five outlets across the island – think eyeliner embroidery, lip colour embroidery, facial treatments, slimming treatments, massage therapy, the whole shebang. Zimin Ho recommends the… 6D Eyebrow Embroidery ($688). The salon's signature service injects pigments of colour into the skin with the use of hand-held blades – totally machine-free. It includes a consultation session, an embroidery procedure, and free touch-ups within the year. 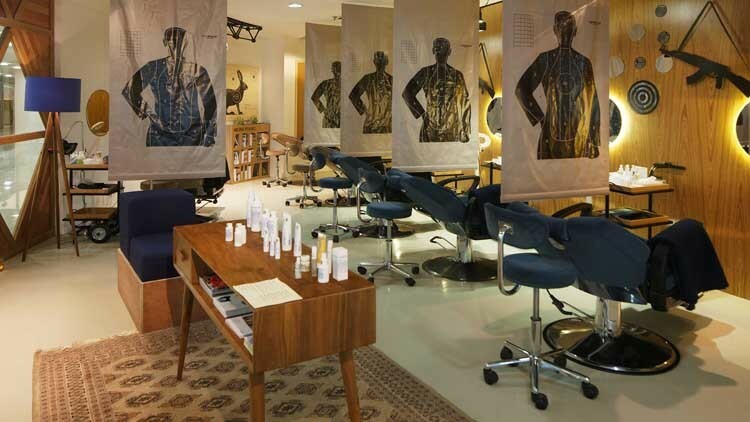 To test the waters before taking the plunge, the salon offers a free consultation session, no strings attached. With three decades of experience under her belt, embroidery specialist Wenz Zhang first drew out my new brows according to my preferences. Although I was initially nervous about the procedure, Zhang’s precision was reassuring. While the embroidery itself smarts, it’s pretty worth it – about 30 minutes of bearable discomfort gets you brows that don’t look too made-up yet are cleaner and bolder than my natural ones. 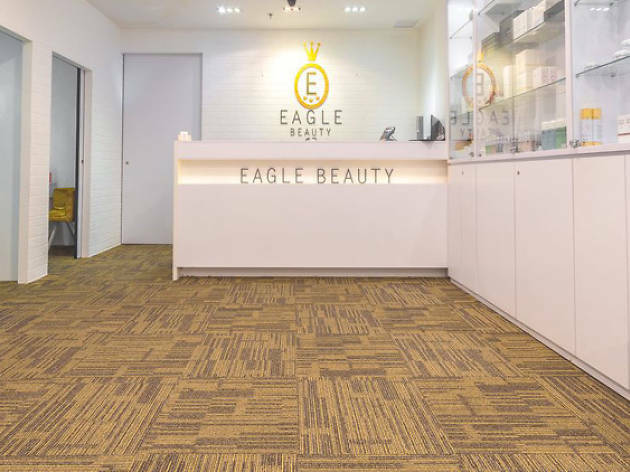 The salon also promises that the embroidery will last between several months to a year. 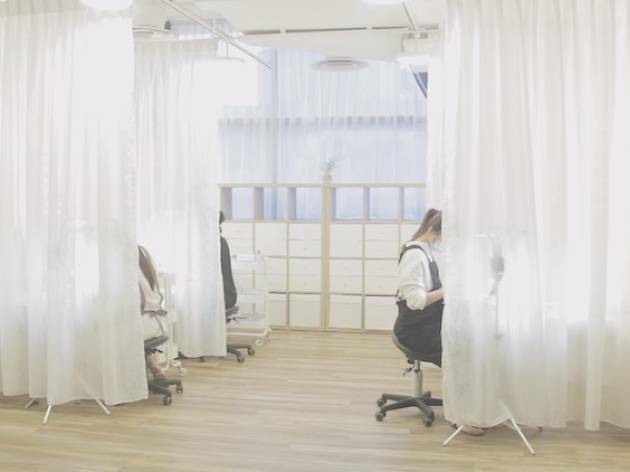 With 13 outlets in Singapore and stores in London, New York, Shanghai, Hong Kong and Manila, Browhaus is one of the more well-known homegrown brow and lash salons. Pop in for an all-in-one Browgraphy (from $41), which includes brow shaping and tweaking your brow colour to suit your new hairdo. Or go all out and get semi-permanent, natural-looking arches constructed with fine strokes using 100% vegetable dye. Michelle Ng recommends the… Brow Resurrection Define ($1,200) and Lash in Bloom ($190), for Instagram baddie brows and thick-framed peepers. Truth be told, the all-natural lash glue stings when it got into my eyes but hey, at least I've now got thick, luscious lashes. Lash extensions are not for the wash-and-go girl, though – these fluttery fringes require plenty of maintenance, and so do the embroidered brows. Instead of putting on fake extensions, which put stress on the roots of your natural lashes, Lash Regrowth’s treatment ($280) stimulates the follicle to encourage growth. During the session, a therapist applies a proprietary serum from Germany to your lashes (or brows) and runs a machine with a micro-needle tip over the area so the product penetrates deep into the skin. Nicole-Marie Ng recommends the… Lash Regrowth treatment ($380). Lest you get turned off by the sound of a micro-needle hovering over your eye, let me assure you that the lash regrowth treatment is completely painless. Instead, you’ll feel a gentle vibration rubbing against your skin and the process was comfortable enough that I almost fell asleep. However, it took at least two sessions for noticeable changes to be seen in the length of my lashes – so don’t expect instant results.